These are the people that voluntary sector organisations were often set up to represent and serve. Given this the paper asks whether voluntary sector organisations are, in the current period, complying with or resisting austerity. When we take a long historical view we see the repeated failure of the market, state and the voluntary sector to meet welfare need. We have moved from feudal obligations to the poor through the ideal of a universal welfare state to a mixed welfare model and now to austerity and the withdrawal of welfare. The research is longitudinal and builds on cross sectional case studies conducted in 2005-06. It uses repeat interviews, conducted in 2014-15, with voluntary sector chief executives and senior managers from the original study to look at what has changed over the last decade. It looks at their perceptions of how the role of the voluntary sector in welfare has changed as a result of the financial crisis and austerity. This type of longitudinal study can be of particular relevance to researching the voluntary sector given its complex role in a continuously changing social context (Macmillan 2011). Longitudinal research is commonly accepted in quantitative research but is considered a relatively novel approach in qualitative research. However, it is important to social policy research as it offers the potential to analyse change over time as part of an iterative analytical process to see ‘how people experience, interpret and respond to change (Corden and Millar 2007, Hermanowicz 2013). CEOs and senior managers paint a complex picture as the autonomy and independence of voluntary organisations has always been challenged resulting in a continuous negotiation of a contested space between the state, market and civil society. However, funding and regulatory changes since 2008 have had an impact on voluntary organisations reducing autonomy and independence at the same time as demand for services has increased and resources have diminished. CEOs and senior managers reported a tougher environment for voluntary organisations and a climate of fear around centralised control resulting in a compliance culture and reluctance to speak out due to the threat of funding withdrawal and project or even organisational closure. The stock of the voluntary sector is currently low following numerous recent scandals around fundraising, lobbying, governance, management and accounting failures (Cook 2015). Voluntary organisations in the current period seem unable to put forward counter arguments to austerity and seem inward looking and caged, accountable to the state and funders and not to vulnerable people. There is though, the paper concludes, a need for a radical, resistant and resolute social policy discourse on why we need welfare (Alcock 2016). There is a need for voluntary organisations to speak out for the rational administration of welfare to meets the needs of vulnerable people, support independent community organising and continue to develop effective campaigning strategies to resist damaging austerity (Taylor 2011, Milbourne and Cushman 2013). Mike Hemmings is a lecturer in HRM at York Saint John University. You can contact Mike here. 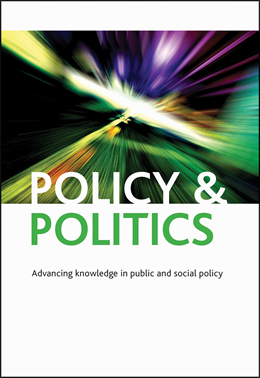 If you enjoyed this blog, you may also like to read Public–private partnerships, management capacity and public service efficiency by Rhys Andrews and Tom Entwistle.